Thordon Bearings has completed a range of water-lubricated and grease-free bearing installations to a third salt lugger in the Salinor/Navenor fleet, following the successful retrofitting of bearings to problematic newbuilds. The Brazilian owner opted for the Thordon package following the rapid failure of the bronze and phenolic bearings supplied by a competitor to two newbuilds at the Manaus Shipyard delivered in 2015. The salt carrier Nossa Sra. das Das Vitorias was retrofitted with Thordon’s SXL propeller shaft bearings after just three weeks of operation, while sistership Dona Zita was retrofitted with RiverTough shaft bearings and hardened steel liners in 2016. José Fabio S. Camocardi, Managing Director, Thortech, Thordon Bearing’s São Paulo-based distributor, takes up the story. 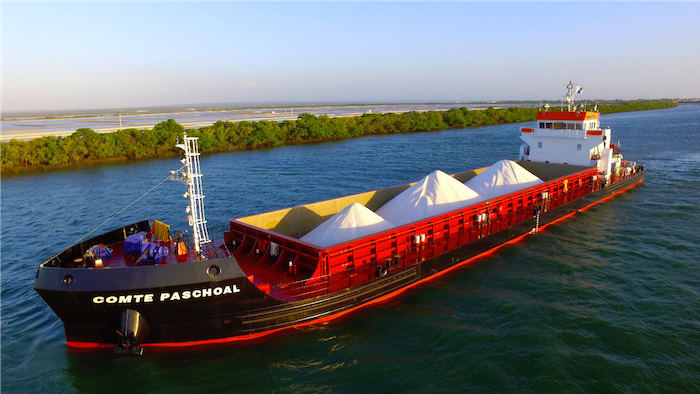 “Salinor/Navenor’s dedicated carriers transport salt from mines located around the Northeast of Brazil area to discharge points offshore Brazil for loading on to larger ocean-going bulk carriers. Based on the success of the Thordon installations, Navenor approached Thortech to supply a complete shaft and rudder bearing and seal package for the newbuild shallow draught bulker Comandante Paschoal. Rio de Janeiro’s São Miguel shipyard delivered the vessel in August 2018. The scope of supply comprised a pair of RiverTough propeller shaft bearings, NCB liners and three TG100 mechanical seals for shaft diameters of 135mm, Thordon SXL rudder bearings for rudder shaft diameters of 168mm, and grease-free ThorPlas-Blue bearings for the vessel’s tiller arms and rudder stocks. Salinor Salinas do Nordeste S.A. is Brazil’s premier salt manufacturer, providing more than 40% of sea salt production in Brazil. Navenor, a Salinor company, is responsible for the transportation of Salinor’s sea salt.